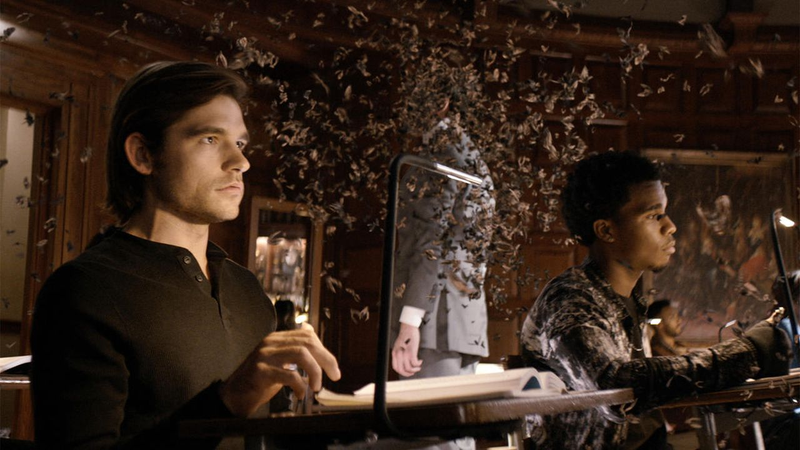 The Syfy channel’s fantasy show The Magicians is coming in on its home stretch this week: as it does so, it’s starting to get dark, and really, really good. Since it got off to a really good start, the show has covered quite a bit of ground, touching base with the books each episode, but pulling individual parts into different episodes, which has given the show a bit of an uneven feel. Now that we’re approaching the final couple of episodes, everything feels like it’s clicking into place. The Magicians is really adapting the first two books in the trilogy, but it’s covering a whole plethora of storylines as it does so: we’ve learned that Fillory is real, and there’s something monstrous living there, and that there’s a sort of underground magical world that exists in the hidden spaces of our own, with wannabe magicians learning from every scrap that they can. The show has put together some really interesting episodes that delved into thet world that Lev Grossman created with his trilogy, all while throwing some curveballs, such as when Quentin wakes up in an institution, with everyone telling him that the magical world is just a delusion, or when they head to Brakebrills South in Antarctica for some extra instruction. The first half of this season has felt like it’s mostly full of filler material: random adventures and escapades that really highlight the sense that this is like Harry Potter, but as college students. It might be filler, but now that we can look back, it’s clear that they’re building blocks for what’s to come for the show, especially now that we know we’re going to get a second season. I think part of the issue that I’ve had with the show so far is that it’s felt really episodic, with each episode pulling out certain things from the book, but treating them as though they’re isolated incidents and adventures from the characters. At the same time, there’s a lot going on. When we first met Quentin, he believed that his childhood fantasy stories were just that: fantasy stories. It’s not long before we learn that not only is Fillory real, magic is real. While he’s attending a magical university, there’s a whole world of tensions between the more legitimate magicians, and the various factions of hedge witches and houses also exist. On top of all that, there’s the random hijinks that any group of students will get up to, just with some extra magical abilities. The last couple of episodes, however, has largely dropped the college hijinks and drama, and has started to focus on the larger story at hand, and this is what’s going to make the show really shine moving forward. The ‘Harry Potter but for adults’ tagline was convenient for selling copies of the books, but it doesn’t make for compelling television. One example of this came in last week’s episode, when Quentin, Alice, Eliot and Penny realize that they need to search the house of Christopher Plover, the author of the Fillory and Further series, to find a link between Earth and Fillory. Quentin, an enormous Fillory nerd, is excited to head over there, only to discover that behind the childhood stories that he loved was a horrific child abuser. The revelation is a pretty big one, because it nibbles away at the edge of magic: the magical world isn’t all wonderful and adventures: there’s terrible people and actions in it. Deflating this sort of expectation is something that the books were excellent at, and it helps to elevate the television series nicely here by connecting what could have been a standalone haunted house episode to much larger actions. For the most part, the college drama episodes that have been so prominent in the first half of the season have been dropped, which in turn, frees up time in the episode to explore the larger story that they’re building out. It’s made the show quite a bit more interesting to watch, especially as we get out of Brakebills. The difference between tones, I think, is now that we’ve gotten out of the day to day elements of Brakebills, the creative team can really roll up their sleeves and pay more attention to the longer story, rather than the more self-indulgent partying aspect that made up the first season. The larger magical world that the magicians are operating holds stakes that are higher for everyone, and ones that drive the story along a bit better than what we’ve had. The side effect here is that the world that Lev Grossman laid out in his books is that the magical world is a deeply messed up place, and it’s dangerous as hell. In Brakebills, the students were largely protected from outside influences, but there was the occasional breach that threatened lives. Now that we’re getting out into the bigger world, the gloves are coming off. As things come together with the last four or so episodes in the season, the show is hitting its stride: it just needed to get its feet under it, and give the audience a bit of context for why things are the way they are. As the first season wraps up, the show is able to tackle some of the darker, more interesting elements that made the book so great, and it holds quite a bit of promise for what’s to come next.